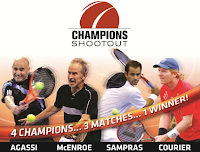 The newly expanded and reformatted Champions Series will begin on September 22 at the Bank Atlantic Center in Fort Lauderdale, FL, taking the highly competitive tennis circuit to a total of 12 U.S. cities over a five week season through October 22. In addition to Agassi, McEnroe, Sampras and Courier, the five-week tour, produced by legendary impresario Larry Magid, will feature fellow Grand Slam champions Michael Chang, Bjorn Borg and Mats Wilander. The athletes will compete for a prize pool totaling $1 million to be shared by the top three finishers at the conclusion of the season.